I have decided to publish volumes 1 and 2 in one book. The book is available as a paper back print and epub. The whole thing can be read as a novel complete in itself. Both novels concern the life and career of famous British tenor. Malcolm Craig, his successful career in Britain, and his three marriages. 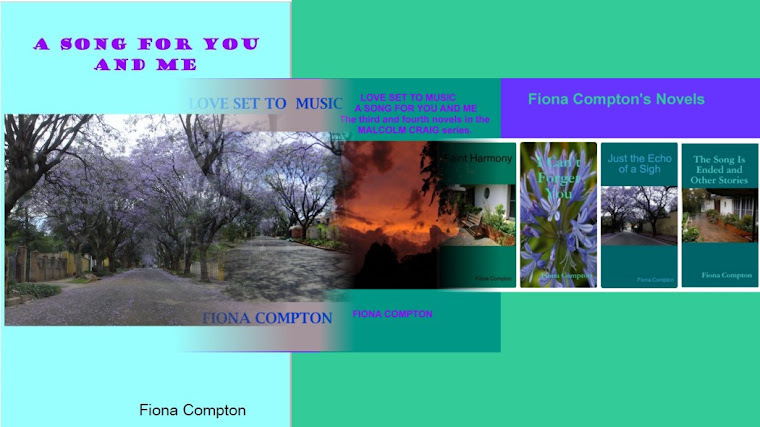 Read more about all my books at: Fiona Compton's books. I was glad to see these two volumes combined in one book as they could be read as a complete book without reading volumes 3 and 4. Fiona Compton has made no secret of the fact that all 4 volumes in the Malcolm Craig series are combinations of Roman a clef and biographical/autobiographical novels. The first two novels are based on her own research about Malcolm Craig and Marina Dunbar in the years of their illustrious lives and theatrical careers until 1956 before she met them, although parts of these books are pure fiction, while other parts are largely true. She has succeeded in creating the atmosphere of the early part of the twentieth century, World War Two and the immediate post war years as they relate to Malcolm and Marina's lives and careers. I recommend this interesting double novel featuring the lively lives and careers of Fiona Compton's fictional heroes - Malcolm and Marina. The last two novels in the Malcolm Craig series combined in one book. Once again, volumes 3 and 4 of the Malcolm Craig series can be read as one novel. Most of it is set in South Africa to where Malcolm Craig and Marina Dunbar move in 1956 after problems with the British Inland Revenue. Their lives take a new direction in a new country. Their marriage is no happier than it was for many years in the UK, and Kate Kyle (the fictional name for Fiona Compton herself) now writes her Roman a Clef/autobiographical novel largely from her own experience, although there are still many fictional elements in the story. In many ways, the idea of Kate and Malcolm having an affair when she is in her late teens, and Malcolm is married, and 42 years older than her, might seem like a shocking state of affairs. The story held my interest and the conclusion to the saga is satisfactory (depending on your point of view) although it is possible that Fiona Compton used her imagination rather than fact to reach this conclusion. I found Love Set to Music most interesting. Neither Kate Kyle nor Malcolm Craig are covered in glory and some might consider their spring/winter relationship unseemly even over fifty years later. They obviously felt deeply for one another and Malcolm Craig's wife, Marina Dunbar, was not without blame. I sincerely hope that the final novel will reach a satisfactory conclusion otherwise the emotion generated by the affair which changed the life of Kate Kyle/Fiona Compton radically without bringing her lasting happiness would have been a meaningless waste of time. The final novel in the Malcolm Craig series, A Song for You and Me, held my interest even more than the three earlier books as this final novel reaches a conclusion to the tale. Like the Christmas Special which concluded the long-running Downton Abbey, the end of Fiona Compton's novel reaches a satisfactory resolution although the finale of the Malcolm Craig series is merely implied, rather than described in graphic detail. One is left to imagine what happens to Malcolm, Kate, and Marina in the years that follow. Somehow I doubt whether the conclusion of this series of novels is the way the tale ended in reality, but perhaps that is why Fiona Compton chose to present it as a work of fiction rather than fact. All the cover photos in the series are by Errol Collen. Fiona Compton. 14 January 2016.